^ Each headstone contains the national emblem or regimental badge, rank, name, unit, date of death and age of each casualty inscribed above an appropriate religious symbol and a more personal dedication chosen by relatives. ^ "Annex B – Territories Forming Part of the Commonwealth" (PDF). Her Majesty's Civil Service. September 2011. Archived from the original (PDF) on 2011-12-06. Retrieved 19 November 2013. ^ "BBC News – Profile: The Commonwealth". news.bbc.co.uk. February 2012. ^ "About us". The Commonwealth. Retrieved 2013-10-03. ^ a b "The Commonwealth". The Commonwealth. Archived from the original on 19 June 2010. Retrieved 30 June 2013. ^ "Imperial Conference 1926 Inter-Imperial Relations Committee Report, Proceedings and Memoranda" (PDF). November 1926. Retrieved 14 June 2018. Their position and mutual relation may be readily defined. They are autonomous Communities within the British Empire, equal in status, in no way subordinate one to another in any aspect of their domestic or external affairs, though united by a common allegiance to the Crown, and freely associated as members of the British Commonwealth of Nations. ^ "The London Declaration". The Commonwealth. Archived from the original on 6 July 2010. Retrieved 4 July 2013. ^ "Charter of the Commonwealth". The Commonwealth. Archived from the original on 4 January 2013. Retrieved 30 June 2013. ^ Queen Elizabeth II (1 July 1959). Queen Elizabeth's 1959 Dominion Day Message. 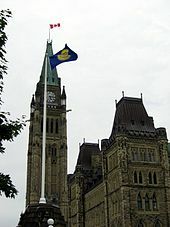 Government House (Rideau Hall), Ottawa: CBC. Retrieved 9 November 2015. ^ "History – Though the modern Commonwealth is just 60 years old, the idea took root in the 19th century". thecommonwealth.org. Commonwealth Secretariat. Archived from the original on 19 June 2010. Retrieved 29 July 2011. ^ Mole, Stuart (September 2004). "Seminars for statesmen': the evolution of the Commonwealth summit". The Round Table. 93 (376): 533–546. doi:10.108n0/0035853042000289128 (inactive 2018-10-15). ^ Pakenham, Frank (1972). Peace by ordeal: an account, from first-hand sources of the negotiation and signature of the Anglo-Irish Treaty 1921. Sidgwick and Jackson. ISBN 978-0283979088. ^ Historical Dictionary of European Imperialism. Westport, Connecticut: Greenwood Publishing Group. 1991. pp. 297–298. ISBN 978-0313262579. ^ Webb, Jeff A. (January 2003). "The Commission of Government, 1934–1949". heritage.nf.ca. Newfoundland and Labrador Heritage Website. Retrieved 29 July 2011. ^ "Statute of Westminster Adoption Act 1942 (Cth)". foundingdocs.gov.au (Documenting a Democracy). Museum of Australian Democracy at Old Parliament House. Retrieved 29 July 2011. ^ "New Zealand Sovereignty: 1857, 1907, 1947, or 1987?". parliament.nz. Parliament of New Zealand. August 2007. Archived from the original on 2011-05-22. Retrieved 29 July 2011. ^ Dugard, John; Bethlehem, Daniel; Plessis, Max du; Katz, Anton (2005). International law: a South African perspective. Lansdowne, South Africa: Juta. p. 19. ISBN 9780702171215. ^ "Celebrating thecommonwealth@60". thecommonwealth.org. Commonwealth Secretariat. 26 April 2009. Archived from the original on 4 August 2009. Retrieved 29 July 2011. ^ Chris Cook and John Paxton, Commonwealth Political Facts (Macmillan, 1978). ^ Brian Harrison, Seeking a Role: The United Kingdom 1951—1970 (Oxford UP, 2009), p. 102. ^ Theresa Walton and Susan Birrell. "Enduring Heroes: Hillary, Bannister, and the Epic Challenges of Human Exploration." Journal of Sport History 39.2 (2012): 211–226. ^ Harrison, Seeking a Role: The United Kingdom 1951—1970, p. 103. ^ Krishnan Srinivasan, "Nobody's Commonwealth? 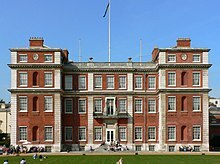 The Commonwealth in Britain's post-imperial adjustment." Commonwealth & Comparative Politics 44.2 (2006): 257–269. ^ "Staying loyal to George". indianexpress.com. ^ High Commissioner in United Kingdom (24 November 1952). "Royal Style and Titles". Documents on Canadian External Relations > Royal Style and Titles. 18 (2). DEA/50121-B-40. Archived from the original on 23 November 2011. ^ Smy, William A. (2008). "Royal titles and styles". The Loyalist Gazette. XLVI (1). Archived from the original on 11 July 2012. Retrieved 3 January 2011. ^ Toporoski, Richard. "The Invisible Crown". Monarchy Canada. Archived from the original on 9 February 2008. Retrieved 20 April 2008. ^ www.bibliopolis.com. "A Message from the Rt. Hon. Winston S. Churchill, C.H., M.P. President, British Section, New Commonwealth Society by Winston S. Churchill on Churchill Book Collector". Churchill Book Collector. ^ Hennessy, Patrick (2004-06-05). "Blair calls for quotas on immigrants from 'New Commonwealth'". ^ de Villiers, Marq (1998). "Review of The Ambiguous Champion: Canada and South Africa in the Trudeau and Mulroney Years by Linda Freeman". International Journal. 53 (4): 783–785 : 783. doi:10.2307/40203728. ISSN 0020-7020. JSTOR 40203728. ; Miles, Robert (2016). "The Racialization of British Politics". Political Studies. 38 (2): 277–285. doi:10.1111/j.1467-9248.1990.tb01493.x. ISSN 0032-3217. ^ Gowland, David; et al. (2009). Britain and European Integration Since 1945: On the Sidelines. Routledge. p. 46. ISBN 9781134354528. 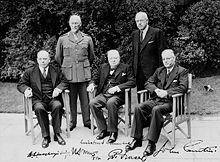 ^ James R. V. Ellison, "Perfidious Albion? Britain, Plan G and European Integration, 1955–1956," Contemporary British History (1996) 10#4 pp 1–34. ^ Martin Schaad, "Plan G – A "Counterblast"? British Policy Towards the Messina Countries, 1956," Contemporary European History (1998) 7#1 pp 39–60. ^ "BBC NEWS – UK – When Britain and France nearly married". news.bbc.co.uk. 2007-01-15. ^ Frank Heinlein (2013). British Government Policy and Decolonisation, 1945–63: Scrutinising the Official Mind. Taylor & Francis. pp. 137–43. ISBN 9781135284411. ^ a b c Patterson, Percival (24 October 2007). "Report of the Committee on Commonwealth Membership". Commonwealth Secretariat. Archived from the original on 26 April 2009. Retrieved 29 June 2008. ^ "Head of the Commonwealth". Commonwealth Secretariat. Archived from the original on 30 September 2006. Retrieved 29 June 2008. ^ Walker, Peter (20 April 2018). "Prince Charles to be next head of Commonwealth". The Guardian. Retrieved 3 December 2018. ^ "The Commonwealth at and immediately after the Coolum CHOGM". The Round Table. 91 (364): 125–129. April 2002. doi:10.1080/00358530220144139. ^ a b Cook and Paxton, Commonwealth Political Facts (1978) part 3. ^ Dale, William (July 1982). "Is the Commonwealth an International Organisation?". International and Comparative Law Quarterly. 31 (3): 451–73. doi:10.1093/iclqaj/31.3.451. ^ Clute, Robert E.; Wilson, Robert R. (July 1958). "Commonwealth and Favored-Nation Usage". American Journal of International Law. 52 (3): 455–468. doi:10.2307/2195461. JSTOR 2195461. ^ Hedley, Bull (July 1959). "What is the Commonwealth?". World Politics. 11 (4): 577–87. doi:10.2307/2009593. JSTOR 2009593. ^ "Support for British nationals abroad: a guide" (PDF). Foreign and Commonwealth Office. 2013. p. 5. Archived from the original (PDF) on 19 October 2013. We may also help Commonwealth nationals in non-Commonwealth countries where they do not have any diplomatic or consular representation, but will normally ask their nearest embassy to provide any ongoing assistance required. ^ "Canada-Australia Consular Services Sharing Agreement". Travel.gc.ca. 2012-11-16. Retrieved 25 September 2014. ^ de Smith, S.A. (July 1949). "The London Declaration of the Commonwealth Prime Ministers, 28 April 1949". The Modern Law Review. 12 (3): 351–354. doi:10.1111/j.1468-2230.1949.tb00131.x. JSTOR 1090506. ^ a b "Lusaka Declaration on Racism and Racial Prejudice". Commonwealth Secretariat. 7 August 1979. Archived from the original on 30 September 2006. Retrieved 3 April 2008. ^ Williams, Paul D. (July 2005). "Blair's Britain and the Commonwealth". The Round Table. 94 (380): 381–391. doi:10.1080/00358530500174960. ^ "Harare Commonwealth Declaration". Commonwealth Secretariat. 20 October 1991. Archived from the original on 7 February 2004. Retrieved 29 July 2007. ^ "Commonwealth Ministerial Action Group". Commonwealth Secretariat. Archived from the original on 30 September 2006. Retrieved 29 July 2007. ^ a b te Velde-Ashworth, Victoria (10 October 2005). "The future of the modern Commonwealth: Widening vs. deepening?" (PDF). Commonwealth Policy Studies Unit. Archived from the original (PDF) on 22 July 2007. Retrieved 29 July 2007. ^ "Commonwealth membership in focus at London meeting". Commonwealth Secretariat. 6 December 2006. Archived from the original on 13 March 2007. Retrieved 29 July 2007. ^ Osike, Felix (24 November 2007). "Rwanda membership delayed". New Vision. Archived from the original on 23 January 2013. Retrieved 29 November 2009. ^ "Rwanda: Joining the Commonwealth". The New Times. AllAfrica. 27 November 2009. ^ Kron, Josh (28 November 2009). "Rwanda Joins British Commonwealth". The New York Times. Retrieved 29 November 2009. ^ "Conference on Rwanda's Commonwealth bid to be held". The New Times. 3 August 2008. Retrieved 25 September 2015. ^ "Country Comparisons – Population". The World Factbook. Central Intelligence Agency. 19 March 2009. Retrieved 22 March 2009. ^ "Tuvalu: Key Facts". Commonwealth Secretariat. 19 March 2009. Archived from the original on 29 October 2007. Retrieved 18 May 2011. ^ "Country Comparisons – Area". The World Factbook. Central Intelligence Agency. 19 March 2009. Retrieved 22 March 2009. ^ McIntyre, W. David (April 2008). "The Expansion of the Commonwealth and the Criteria for Membership". Round Table. 97 (395): 273–85. doi:10.1080/00358530801962089. ^ "Nauru back as full Commonwealth member". Radio New Zealand International. 26 June 2011. Retrieved 26 July 2011. ^ "Nauru Accedes to Full Membership of the Commonwealth". Commonwealth Secretariat. 12 April 1999. Archived from the original on 11 October 2008. Retrieved 30 January 2009. ^ "New Criteria for Commonwealth Membership". thecommonwealth.org. ^ "South Sudan Launches Bid to Join Commonwealth". gurtong.net. ^ a b Alderson, Andrew (17 December 2006). "Israelis and Palestinians could join Commonwealth". The Daily Telegraph. London. Retrieved 29 November 2009. ^ a b "Statement by Commonwealth Secretary-General Kamalesh Sharma on The Gambia". The Commonwealth. 4 October 2013. Retrieved 6 October 2013. ^ a b "The Gambia rejoins the Commonwealth". Commonwealth Secretariat. 8 February 2018. ^ "States and Territories". 15CCEM. Archived from the original on 29 September 2007. ^ Baldacchino, Godfrey; Milne, David (September 2006). "Exploring sub-national island jurisdictions: An editorial introduction". The Round Table. 95 (386): 487–502. doi:10.1080/00358530600929735. ^ "Written evidence from States of Jersey". Chief Minister of Jersey. Retrieved 18 March 2013. ^ "France offered to 'merge' with UK in 1950s". Telegraph.co.uk. 15 January 2007. ^ Colvile, Robert (July 2004). "A Place to Stand: the Problems and Potential of the Commonwealth Ministerial Action Group". The Round Table. 93 (375): 343–53. doi:10.1080/0035853042000249942. ^ Ingram, Derek (October 1999). "Commonwealth Update". The Round Table. 88 (352): 547–567. doi:10.1080/003585399107758. ^ Ingram, Derek (October 2007). "Twenty Commonwealth steps from Singapore to Kampala". The Round Table. 96 (392): 555–563. doi:10.1080/00358530701625877. ^ Ingram, Derek (January 2000). "Commonwealth Update". The Round Table. 89 (353): 45–57. doi:10.1080/750459452. ^ Ingram, Derek (July 2004). "Commonwealth Update". The Round Table. 93 (375): 311–42. doi:10.1080/0035853042000249933. ^ Gruenbaum, Oren (February 2008). "Commonwealth Update". The Round Table. 97 (394): 3–17. doi:10.1080/00358530701864963. ^ a b Ingram, Derek (April 2002). "Commonwealth Update". The Round Table. 91 (364): 131–59. doi:10.1080/00358530220144148. ^ "Zimbabwe applies to rejoin Commonwealth". Al Jazeera. 2018-05-22. Retrieved 2018-05-22. ^ a b c d "Fiji Suspended from the Commonwealth". Commonwealth Secretariat. 1 September 2009. Archived from the original on 4 September 2009. Retrieved 1 September 2009. 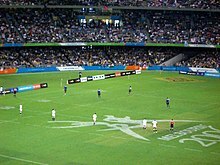 ^ "Fiji Rejoins the Commonwealth". Commonwealth Secretariat. 30 September 1997. Archived from the original on 1 November 2004. Retrieved 1 September 2009. ^ Ingram, Derek (July 2000). "Commonwealth Update". The Round Table. 89 (355): 311–55. doi:10.1080/00358530050083406. ^ a b "Fiji suspended from Commonwealth". BBC News. 8 December 2006. Retrieved 1 February 2009. ^ "Foreign & Commonwealth Office Minister welcomes Commonwealth statement on Fiji – GOV.UK". www.gov.uk. ^ "Fiji rejoins Commonwealth as a full member". The Commonwealth. 26 September 2014. Retrieved 28 September 2014. ^ Nasik Swami (28 September 2014). "We're back". Fiji Times. Retrieved 28 September 2014. ^ David Miliband (11 March 2013). "Britain must stand up for human rights in Sri Lanka". The Guardian. M.guardian.co.uk. Retrieved 18 April 2013. ^ Mike Blanchfield (14 January 2013). "Harper rebukes Sri Lanka over jurist's dismissal as talk of summit boycott heats up". The Globe and Mail. Retrieved 18 April 2013. ^ "The Commonwealth Secretariat". 2016-10-13. Retrieved 2016-10-13. ^ a b c "The Maldives decides to leave the Commonwealth; commits to continue with its international engagement". Maldivian Ministry of Foreign Affairs. 13 October 2016. Archived from the original on 14 October 2016. Retrieved 13 October 2016. ^ "Maldives to rejoin Commonwealth of former British colonies". The National. 2018-11-20. Retrieved 2018-11-23. ^ Commonwealth Observer Group (1999). The National and Provincial Elections in South Africa, 2 June 1999. p. 7. ISBN 9780850926262. ^ "Singapore Declaration of Commonwealth Principles 1971" (PDF). thecommonwealth.org. Commonwealth Secretariat. 22 January 1971. Retrieved 15 November 2013. ^ "Langkawi Declaration on the Environment". USM Regional Center of Expertise in Education for Sustainable Development. 21 October 1989. Retrieved 3 April 2008. ^ Hasu Patel, "Southern Africa and democracy, in the light of the Harare declaration." The Round Table 89.357 (2000): 585–592. ^ "Our Work". Commonwealth Secretariat. Archived from the original on 20 August 2006. Retrieved 3 April 2008. ^ "Aso Rock Commonwealth Declaration" (PDF). Commonwealth Secretariat. 8 December 2003. Archived from the original (PDF) on 13 June 2006. Retrieved 3 April 2008. ^ "Commonwealth Secretariat". Commonwealth Secretariat. 7 August 1979. Retrieved 3 April 2008. ^ Borger, Julian; editor, diplomatic (8 October 2010). "Commonwealth has abandoned human rights commitment – leaked memo". The Guardian – via The Guardian. ^ a b Cheadle, Bruce (30 October 2011). "Commonwealth leaders agree to develop charter of values and little else". Toronto Star. Retrieved 30 October 2011. ^ Cheadle, Bruce (29 October 2011). "Commonwealth leaders still haggling over human rights reforms". Toronto Star. Retrieved 29 October 2011. ^ a b Watt, Nicholas (29 October 2011). "Commonwealth leaders under fire for refusing to publish human rights report". The Guardian. Retrieved 29 October 2011. ^ "Queen to sign new charter backing equal rights for gay people across Commonwealth". Standard.co.uk. 11 March 2013. Retrieved 18 April 2013. ^ "Commonwealth charter to focus on gay rights". The Times of India. 11 March 2013. Archived from the original on 11 April 2013. Retrieved 18 April 2013. ^ Skinner, James (17 March 2015). "Free movement proposed between Canada, U.K, Australia, New Zealand". CBC News. Retrieved 3 September 2016. ^ Bourke, Latika (21 May 2016). "Alexander Downer flags 'freer movement' for Australians emigrating to Britain". Sydney Morning Herald. Retrieved 3 September 2016. ^ "Gross domestic product 2012" (PDF). World Bank. 1 July 2013. Archived from the original (PDF) on 10 August 2013. Retrieved 1 July 2013. ^ "GDP per capita (current US$)". World Bank. Retrieved 1 July 2013. ^ "Gross domestic product 2012, PPP" (PDF). World Bank. 1 July 2013. Archived from the original (PDF) on 10 August 2013. Retrieved 1 July 2013. ^ "GDP per capita, PPP (current international $)". World Bank. Retrieved 1 July 2013. ^ Catherine R. Schenk, "Britain in the world economy." in Paul Addison and Harriet Jones, eds., A Companion to Contemporary Britain: 1939–2000 (2005): 436–481, esp. 469-71. ^ Alan S. Milward, The rise and fall of a national strategy, 1945–1963 (2002). ^ Ben Pimlott (1998). The Queen: A Biography of Elizabeth II. p. 416. ISBN 9780471283300. ^ Gill Bennett (2013). Six Moments of Crisis: Inside British Foreign Policy. p. 87. ISBN 9780191641633. ^ Gregory A. Johnson, "The Last Gasp of Empire: The 1964 Flag Debate Revisited," in Phillip Buckner, ed., Canada and the End of Empire (U of British Columbia Press, 2005) p. 6. ^ Andrea Benvenuti, "'Layin' Low and Sayin' Nuffin': Australia's Policy towards Britain's Second Bid to Join the European Economic Community (1966–67)" Australian Economic History Review 46#2 (2006): 155–175. ^ Bruce Brown (1977). New Zealand in World Affairs: 1972–1990. Victoria UP. p. 23. ISBN 9780864733726. ^ "Trading Places: The "Commonwealth effect" revisited, p. 9" (PDF). ^ "Commonwealth Secretariat – Valletta Statement on Multilateral Trade". Thecommonwealth.org. 2005-11-26. Archived from the original on 2013-01-05. Retrieved 2012-09-27. ^ "The role and future of the Commonwealth" (PDF). British Parliament. 15 November 2012. Retrieved 29 June 2013. ^ "Why the Commonwealth Matters More Now than Ever". UK Independence Party. 11 March 2013. Archived from the original on 29 June 2013. Retrieved 29 June 2013. ^ "To the Commonwealth, "Global Britain" sounds like nostalgia for something else". New Statesman 28th February 2017. ^ "Assessing the Costs and Benefits of a Closer EU – Canada Economic Partnership: A Joint Study by the European Commission and the Government of Canada" (PDF). Trade.EC.Europe.eu. Retrieved 10 June 2017. ^ "Canada-European Union: CETA". International.gc.ca. Archived from the original on 2012-05-03. Retrieved 2012-09-27. ^ a b McKinnon, Don (February 2008). "A Commonwealth of Values: a Commonwealth of incomparable value". The Round Table. 97 (394): 19–28. doi:10.1080/00358530801890561. ^ a b "Commonwealth Games and Art Festival". The Round Table. 91 (365): 293–296. July 2002. doi:10.1080/0035853022000010308. ^ McDougall, Derek (July 2005). "Australia and the Commonwealth". The Round Table. 94 (380): 339–349. doi:10.1080/00358530500175033. ^ Muda, Muhammad (April 1998). "The significance of the Commonwealth Games in Malaysia's foreign policy". The Round Table. 87 (346): 211–226. doi:10.1080/00358539808454416. ^ a b Dare, Annie (15 October 2000). "Ten Key Things About War Graves". The Observer. p. 29. ^ a b c Binyon, Michael (22 January 1999). "Millions trace war dead on Internet". The Times. p. 3. ^ Geurst, Jeroen (2010). Cemeteries of the Great War By Sir Edwin Lutyens. ISBN 978-90-6450-715-1. ^ "Commonwealth Local Government Forum (CLGF) | The Commonwealth". thecommonwealth.org. Retrieved 2017-02-23. ^ "Global Taskforce of Local and Regional Governments". globaltaskforce. Retrieved 2017-02-23. ^ Perkin, Harold (September 1989). "Teaching the nations how to play: sport and society in the British Empire and Commonwealth". International Journal of the History of Sport. 6 (2): 145–155. doi:10.1080/09523368908713685. ^ Michael, Dawson (February 2006). "Acting global, thinking local: 'Liquid imperialism' and the multiple meanings of the 1954 British Empire & Commonwealth Games". International Journal of the History of Sport. 23 (1): 3–27. doi:10.1080/09523360500386419. ^ Jonathan, Clayton (20 November 2007). "Schoolboy cricketers bat their way to a place in the Commonwealth". The Times. London. Retrieved 27 March 2009. ^ Pflanz, Mike (24 July 2007). "Rwanda in drive to join Commonwealth". Daily Telegraph. London. Retrieved 27 March 2009. ^ Hill, Douglas (1 October 1988). "A report on stories from the outposts of Commonwealth literature". The Globe and Mail. p. 21. ^ McCrum, Robert (13 October 2003). "English Is a World Language – and That's to Be Prized". The Los Angeles Times. p. B15. ^ Tunca, Daria (27 September 2018). "ACLALS: Association for Commonwealth Literature and Language Studies". ACLALS. Retrieved 13 December 2018. ^ Iyer, Pico (12 February 1993). "The Empire Writes Back". The Straits Times. p. 1. ^ "Meet the Man Booker Prize 2014 Judges". The Man Booker Prizes. 12 December 2013. Retrieved 10 June 2017. ^ Drabble, Margaret, ed. (1996). The Oxford Companion to English Literature. Oxford: Oxford U.P. ^ "The Nobel Prize in Literature 2007". Nobelprize.org. Retrieved 10 June 2017. ^ "2001 Laureates". Literature. The Nobel prize. ^ Man Booker official site: J. G. Farrell; Hilary Mantel: J. M. Coetzee Archived 17 March 2016 at the Wayback Machine. ^ The Statesman's Yearbook 2017: The Politics, Cultures and Economies of the World. Palgrave Macmillan UK. 2017. p. 46. ISBN 9781349683987. ^ Dhananjayan Sriskandarajah. "Canada, Commonwealth and the key to relevance". The Globe and Mail. Retrieved 18 April 2013. ^ Elizabeth Renzetti. "Commonwealth: quaint historical relic or meaningful bloc?". The Globe and Mail. Retrieved 18 April 2013. ^ "Queen marks Commonwealth launch". BBC News. Retrieved 5 August 2014. ^ "A Celebration of Her Majesty's Sapphire Jubilee". Commonwealth Music Council. 2016. ^ "Commonwealth Anthem (with introductory narrative)". 13 September 2017. ^ "Windsor Suite Commonwealth Anthem". 20 March 2018.